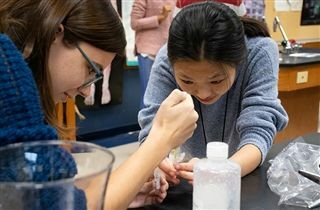 Students in Jason Johnson’s AP Biology class recently completed a lab on bacterial transformation. Transformation of cells is a widely used and versatile tool in genetic engineering and is of critical importance in the development of molecular biology. Taking a gene from jellyfish, students attempted to add it into E. Coli bacteria to produce fluorescence. The goal of the experiment was to get the transformed bacteria to glow bright green under a blacklight. In order for this to happen, the students had to be very precise and pay close attention to detail throughout the process.